Several months ago, I was invited to share a blog with a stranger. On that blog, I was asked to write about art & reciprocity. I met Erik Hagoort that way. I read his posts and he read mine. Sometimes we responded to one another. The blog itself came from a larger project artists Kirsten Leenaars andÂ Lise Haller Baggesen were curating. 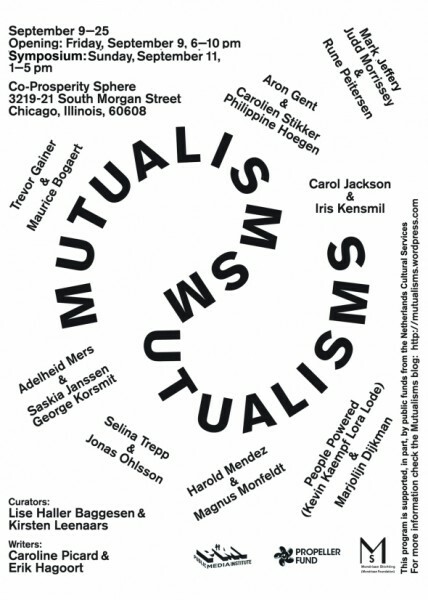 That show, Mutualisms, (opens this Friday September 9th at the CoProsperity Sphere) features work made by artists paired together–half of the pair comes from the Netherlands, the other half is local to Chicago. Over the last six+ months, these pairs have been working together, building a dialogue more or less from scratch, in order to install work here. It’s a show about networks and relationships. It’s a show about community, and how that can arise with an ocean between us. In addition to the exhibit, CoPro is also hosting a symposium on Sunday (September 11th, from 1-5) to address the issue of art and reciprocity: an interesting question, given that so much of what we think about in terms of community building and art relies on expectations of return, or taking turns, or sharing. How do those themes also manifest themselves in a discrete work of art born from collaboration? In the following interview, Erik and I asked Lise and Kirsten some questions about the origin of the show, how to think about it critically, and even how its global perspective addresses arts funding strategies. 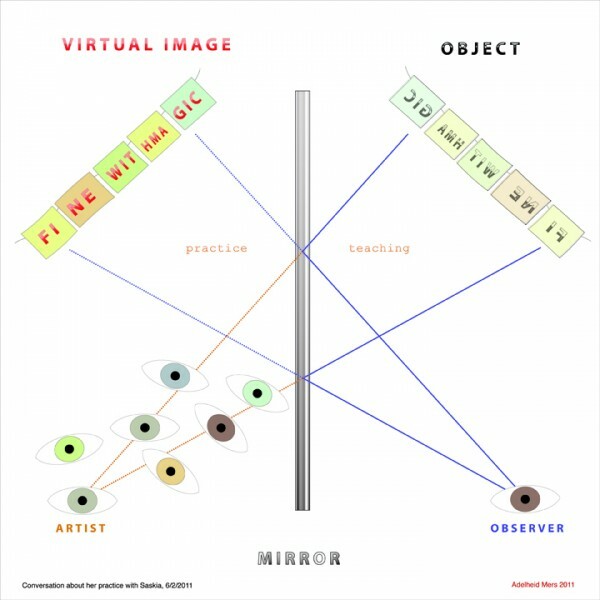 Caroline Picard: So often an exhibition is the culmination of work; while of course, MutualismsÂ is a culmination,there has been an on-going dialogue taking place on-line via blogs (both the one that you all keep as the Mutualisms site, and of course the blog you invited me to participate on with Erik). How did you think to frame the project via blogs and exhibitions? And what was it like pairing artists in different parts of the world? Kirsten Leenaars &Â Lise Haller Baggesen: We had just met in Chicago last year, right before the Propeller Fund application was due. One of the things we had been talking about is that we at times had missed an international influx of artists in Chicago. The other thing that struck us is that while having both lived in Amsterdam and now in Chicago we had been part of quite different artistic and friend networks that only partially overlapped. Adding these elements up thought we could combine our networks to create an extended grid from which to organize a show. So, you could say that the show also came about as a mutual exchange between us [Kirsten and Lise], due to a need of expanding our own artistic and social horizons, the main idea being that the art world functions more or less through connections and relationships. We wanted to create a platform through which we could facilitate these relationships and form new connections amongst our combined networks. Because we both are primarily artists, makers, and curators and thinkers secondarily, we curated the show very much from the point of view of the individual artistâ€™s practice, rather than as an illustration of an intellectual or theoretical idea (not that we are anti-intellectuals, far from it!). So, we tried to combine artists that we felt had a similar approach or a similar sensibility, hoping that the connections we observed were something they could see too, or that they might discover their own links through a dialogue with each other about their own practices. When we invited the artists to participate in the show we made very clear that the dialogue between each pair was an essential part of the concept and that they needed to be willing to engage in this what undoubtedly was at times-especially at first â€“ potentially an awkward exchange. Kind of like any first date can be. Some of the pairs readily jumped to the occasion and hit it off immediately, others definitively needed a little bit more time and coercing. Both and even the potential for a mismatch are part of concept of the show and we guess in some ways a risk we as the curators or organizers took. Our main objective really was to plant some seeds for potential mutual relationships that would grow and develop and extend beyond the scope of the Mutualisms project. The blogs seemed to just be a very logic consequence of the fact that the artists were residing on different continents and the blog became a space where they could meet. Not just as a pair but also as the group on a whole. The blog allowed them to also see how the other pairs were connecting and what ideas were being exchanged. In addition we thought it would be make this process visible and public â€” often this kind of exchange often remains quite private â€“ because the dialogue can get quite personal â€“ but it gives great insight to the artistâ€™s practice and creates almost organically a context for the work and the show on the whole. Adelheid Mers, "Conversations with 8 artists about their practice", 2011, inkjet on paper, 42"x120"
Funnily enough, both sides of the arts funding argument like to pull the â€˜qualityâ€™ card, as an argument for their stance. I.e. a private art market leads to â€˜better artâ€™ because the artists have to fend for themselves vs. art funding leads to â€˜better qualityâ€™ art because you have a â€™peer support systemâ€™ that is free of commercial interests. But, when you look around in the show, itâ€™s not lack of quality that characterizes either group, to the contrary! There are different sensibilities of course, that are typical of American vs. European works, that has to do with a sense of place and belonging to a certain cultural heritage, but just as often itâ€™s hard to tell off hand which is which, and quality wise they are certainly level pecking! Erik Hogaart:Â Â Since the mid nineties of the last century the so-called relational tendency in the art world seems to prevail. This is not only referring to Nicolas Bourriaud’s famous statement of art being a state of encounter. The ‘relational’ has had a much wider impact, even extending into a feeling that networks of artists, curators, and audience not only surround the art work but become even artworks in themselves. This doesn’t exclude the appreciation of artworks of course, artists and curators involve other artists and curators on the basis of what they make and do. Yet, relations, even friendship seems to take a bigger part of the “art’s cake”. Russian curator Viktor Misiano has called it the tendency of confidentiality. And a project such as Mutualisms could, thinking along, also be called a confidential project. What do you, Lise and Kirsten, think of this? What is the balance for you between creating an opportunity for artists to make works, and creating an opportunity for artists to relate to one another. These two aspects of Mutualisms are of course connected, but in what way? the way we had curated the show and where these artists were coming from. Yes, these artists were selected from our pool of friends and acquaintances. This is perhaps often an unspoken given â€” something acknowledged behind closed doors â€” but being transparent about that is really at the base of our concept for the show. And in that sense never confidential. In addition these relationships are documented and visible for the public on our blogs. Secondly, yes, the primary reason for choosing each of the artists was based on their own strong practices, not on how much we liked the individual. One does not exclude the other, and what could be potentially more productive than fostering a relationship between a pair of driven practitioners? The dialogue ultimately has the objective to allow new ways of looking at each otherâ€™s practice, to inspire a dialogue about ways of thinking and making that ultimately find their ways back to an artistâ€™s practice. Of course if the match truly was a productive one, perhaps this can lead to other opportunities, further productions and collaborations etc. We do hope for these relationships â€“ as mentioned before â€“ to extend beyond Mutualisms. And if friendships are formed through this dialogue as well, than that is an added bonus. EH: A question, which is philosophically triggered by Jacques Derrida’s statement: “the artwork is vertical, and slightly leaning.” This idea of the verticality of the artwork stresses confrontation, awe, being struck. Quite opposite is the idea of relationships and networks, which stresses horizontality, encounter between entities in the same/ equal position. 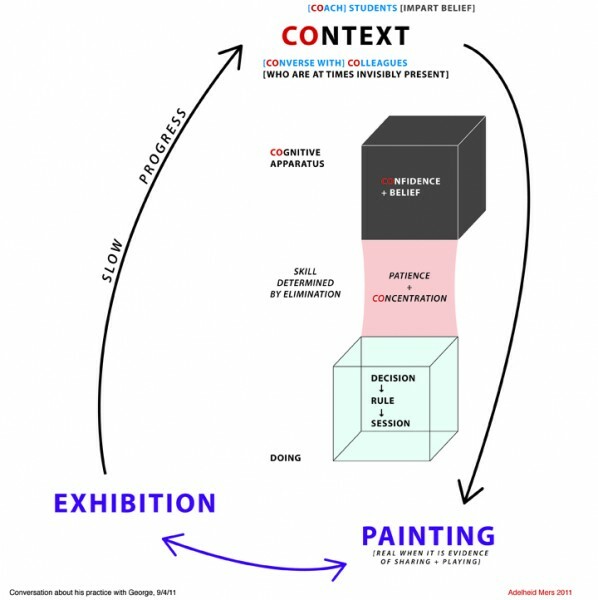 Especially when artists connect to each other, and form mutual networks, how does these two models fit in? Mutualism, or reciprocity: how does it relate to these two concepts. Is there still space for the vertical within the horizontal? Yes, that is a risk, and a risk we embraced as we were preparing for the show, because the encounter or the exchange that this structure entails, also invites the possibility of the whole being greater than the sum of the parts. Just like the idea of democracy: â€˜together we are strongâ€™ this show was an open invitation to the artists to participate in a dialogue, in which they could make new art works that lay outside the boundaries of their own practice, or by pairing individual (existing) works that would allow the work to be contextualized in a new way. Some of the artists involved really stepped up to this challenge and engaged in a creative process, with an outcome that was surprising both to us, and to themselves. Others, you could say, â€˜played it safeâ€™ and are showing more in parallel. Every art work implies an encounter, social relationship. Namely between the artÂ work and the viewer. Approaching art in this way implies an investigation of the social situation in which art takes place and encounters society. It focuses on the encounter in the moment of perception and communication, it underlines the role of projection in the exchange with a spectator, a public which is constantly being reconstituted. What does that ephemeral, individual or collective imagination bring forth? In what way does imagination not only produce the artwork, but also a social relationship? This question is the primary one. Each of the artists that participate, create work. They have different ways of engaging in this process. But for none of the artists is the encounter in itself the artwork. Neither do we as the curators of the show, see the encounter, or the relationship as the work. The show is a model for exchange, this exchange happens between the artists, the curators and ultimately between the viewer and the work that is on display â€“ a result of prior conversations. So with this show we also ask who participates in this process, and what does participation mean in this context? So the horizontal and vertical in our Mutualisms project are two axes in a grid where each of the artists individually and as pairs can be located on different positions within this grid.